Rice bean (Vigna umbellata (Thunb.) Ohwi & Ohashi) is a tropical to temperate grain legume primarily grown for food, especially in Asia. Rice bean seeds and vegetative parts are also used for fodder. Vigna umbellata is a short-lived perennial legume usually grown as an annual. It has a very variable habit: it can be erect, semi-erect or twining. It is usually 30-100 cm in height, but can grow up to 200 cm (Ecoport, 2014). It has an extensive root system with a taproot that can go as deep as 100-150 cm. The stems are branched and finely haired. The leaves are trifoliate with entire, 6-9 cm long leaflets. The flowers, born on 5-10 cm long axillary racemes, are papillonaceous and bright yellow. The fruits are cylindrical, 7.5-12.5 cm long pods that contain 6-10 oblong, 6-8 mm seeds with a concave hilum. Rice bean seeds are very variable in colour, from greenish-yellow to black through yellow, brown. Yellow-brownish types are reported to be the most nutritious. The red type gives its common name to the grain in several languages, for example in Chinese (赤小豆 = red small bean) (Ecoport, 2014). Rice bean is a multipurpose legume, sometimes considered as neglected and underutilised (Joshi et al., 2008). 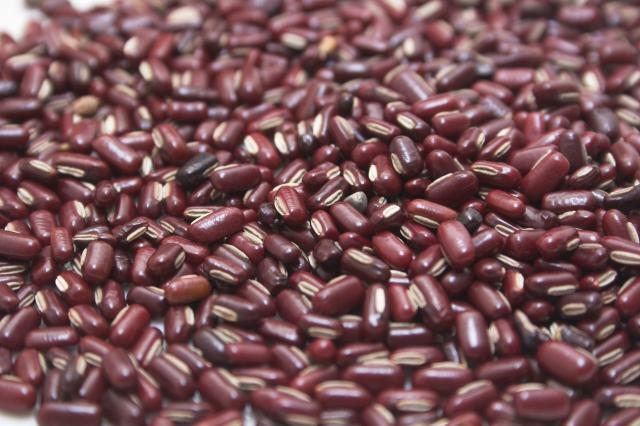 However, though less important than cowpea (Vigna unguiculata), adzuki bean (Vigna angularis) and mung bean (Vigna radiata), rice bean is a locally important contributor to human nutrition in parts of India and South-East Asia (Joshi et al., 2008; Tomooka et al., 2011). All parts of the rice bean plant are edible and used in culinary preparations. The dry seeds can be boiled and eaten with rice or they can replace rice in stews or soups. In Madagascar, they are ground to make a nutritive flour included in the food for children. Unlike other pulses, rice beans are not easily processed into dhal, due to their fibrous mucilage that prevents hulling and separation of the cotyledons (Rajerison, 2006; Ecoport, 2014; van Oers, 1989). 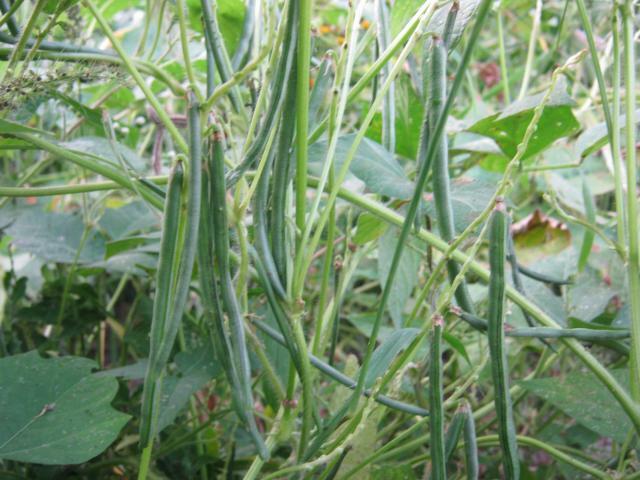 Young pods, leaves and sprouted seeds are boiled and eaten as vegetables. Young pods are sometimes eaten raw (Rajerison, 2006). Rice bean is useful for livestock feeding. The vegetative parts can be fed fresh or made into hay and the seeds are used as fodder. Rice bean straw, the crop residue of the seed harvest, indudes the stems, leafy portions, empty pods, and some seeds (Chaudhuri et al., 1981). Before feeding, the woody portions and soiled or mildewed parts of the straw should be removed (Göhl, 1982). In the marginal hills of Nepal, farmers consider rice bean both as a grain and fodder legume and look for dual-purpose landraces (Khanal et al., 2009). Rice bean is grown for green manure, as a cover crop, and used as a living fence or biological barrier (Ecoport, 2014). Rice bean originated from Indochina and was probably domesticated in Thailand and neighbouring regions (Tomooka et al., 2011). It is found naturally in India, central China and in the Indochinese Peninsula. It was introduced to Egypt, to the East Coast of Africa and to the islands of the Indian Ocean. It is now cultivated in tropical Asia, Fiji, Australia, tropical Africa, the Indian Ocean Islands as well as in the Americas (USA, Honduras, Brazil and Mexico) (Rajerison, 2006; van Oers, 1989; Khadka et al., 2009). In the middle hills of Nepal, rice bean is cultivated along rice bunds and terrace-margins (Khadka et al., 2009). Though it can thrive in the same conditions as cowpea and can better tolerate harsh conditions (including drought, waterlogging and acid soils), rice bean remains an underutilised legume and there is no breeding programme to improve this crop. Farmers must rely on landraces rather than on cultivars (Joshi et al., 2008). Rice bean is a fast summer-growing legume found from sea level up to altitudes of 1500 m in Assam and 2000 m in the hills of the Himalayas (Khadka et al., 2009). Rice bean requires a short day length to produce seeds. It is grown on a wide range of soils, including shallow, infertile or degraded soils. A high soil fertility may hinder pod formation and reduce seed yield (Khadka et al., 2009). Vigna umbellata is a versatile legume that can grow in humid subtropical to warm and cool temperate climates. It is suited to areas with annual rainfall ranging from 1000 to 1500 mm but it is also fairly tolerant of drought. It does better in areas where average temperatures range from 18 to 30°C, tolerates 10-40°C but does not withstand frost (Rajerison, 2006; Ecoport, 2014). It prefers full light and its growth can be hampered if it is intercropped with a tall companion crop that overshadows it, such as maize (Khadka et al., 2009). In India and Nepal, rice bean is sown in February and March for harvest during summer and in July and August for harvest in December (Khanal et al., 2009; Oommen et al., 2002). It can be sown alone in small fields or along bunds of rice terraces. Rice bean benefits from being sown between rows of a tall cereal such as maize or sorghum that it can use for climbing. Rice bean is a hardy plant that is resistant to many pests and diseases, and it does not require fertilizer or special care during growth. In Nepal, farmers clip the tips of the plant to promote pod formation. Rice bean usually matures in 120-150 days after sowing but may need more time at higher altitudes. Seeds are harvested when 75% of the pods turn brown. Harvesting is best done in the morning or late afternoon to reduce the risk of heat-induced shattering. After the harvest, the vines and pods remain on the ground for 2-3 days after which the plants are threshed. The crop residues can then be used as fodder (Khanal et al., 2009). In India, late maturing and photo-sensitive landraces of rice bean are cultivated as a fodder crop. They are sown during long-day periods in order to prevent the plant from flowering (Oommen et al., 2002). Dual-purpose varieties may be cut when the pods are half-grown, but the hay should be handled as little as possible because the leaves drop easily (Göhl, 1982). The seed yield of rice bean is about 225 kg/ha worldwide (Duke, 1981). It can, however, vary from 200-300 kg/ha in West Bengal to 1300-2750 kg/ha in Zambia, Brazil and India (Chandel et al., 1988; Chatterjee et al., 1977). In Bengal (India), fodder yields were reported to range from 5-7 t DM/ha in May and June, to 8-9 t DM/ha in November and December (Chatterjee et al., 1977). Lower values have been reported: 5-6 t DM/ha in Myanmar (Tin Maung Aye, 2001), and 2.9 t DM/ha in the sub-humid Pothwar plateau of Pakistan (Qamar et al., 2014). In India, rice bean grown with Nigeria grass (Pennisetum pedicellatum) yielded 7.6 t DM/ha after the application of 20 kg N/ha (Chatterjee et al., 1977). In Pakistan, rice bean grown with sorghum (50:50 mix) yielded up to 12 t DM/ha (Ayub et al., 2004). Rice bean is an N-fixing legume that improves the N status of the soil, thus providing N to the following crop. Its taproot has a beneficial effect on soil structure and, when ploughed in, returns organic matter and N to the soil. Rice bean grown before or after a rice or maize crop is beneficial. In Thailand, it is profitably sown between the rows of maize once the crop has reached maturity, but before harvest so that rice bean covers enough soil at harvest. It is then possible to harvest the rice bean, thresh to obtain the seeds and bring the dry plants back to the field where they provide soil cover for the dry season (Echo AIC, 2012). In the Thai highlands, rice bean is a valuable green manure, which outcompetes other legumes such as Canavalia ensiformis, Lablab purpureus and Mimosa diplotricha in their ability to improve rice yields (Chaiwong et al., 2012). In China, rice bean used as green manure in tangerine orchards resulted in higher fruit yields than soybean (Glycine max), mung bean (Vigna radiata) and cowpea (Vigna unguiculata) (Wen MingXia et al., 2011). Data on the composition of rice bean forage is scarce. Like other legume forages, fresh rice bean forage is relatively rich in protein, though its concentration is extremely variable (17-23% DM). Rice bean hay and straw are slightly less nutritious (16 and 14% protein in the DM, respectively). Rice bean forage is also rich in minerals (10% of the DM in the fresh forage), and particularly in calcium (up to 2% in the fresh forage). Rice bean straw contains large amounts of mineral matter (more than 20% of DM) though it is highly variable. Rice bean seeds are rich in protein (18-26% DM), though generally less than pea (Pisum sativum) or cowpea (Vigna unguiculata). They contain limited amounts of fibre and fat (about 4 and 2%, respectively). The amino acid profile is comparable to that of other grain legumes: it is relatively rich in lysine (more than 6% of the protein) but poor in sulphur-containing amino acids. Rice beans have a high starch concentration, with reported values ranging from 52 to 57% of the DM (Kaur et al., 1990; Chavan et al., 2009). The amylose content of the starch is extremely variable, from 20 to 60% (Kaur et al., 2013). Rice bean forage contains variable amounts of condensed tannins (0.1-2.8% DM) (Wanapat et al., 2012; Chanthakhoun et al., 2010). Like many grain legumes, rice bean seeds contain antinutritional factors. Antitrypsin activity is notable though comparable to that of cowpea (Vigna unguiculata) and black gram (Vigna mungo). Hemagglutinin activity was found to be lower than that of the two latter legumes (Malhotra et al., 1988). Relatively low levels of phenols and phytic phosphorus have been reported (Gupta et al., 1992). Rice bean fodder (fresh, hay and straw) and rice bean seeds can be fed to ruminants. Rice bean forage at the pre-flowering stage is palatable to sheep (Chandel et al., 1988). In Nepal, farmers have emphasized the softness and palatability of rice bean fodder for livestock (Joshi et al., 2008). In an experiment with rice bean hay in India, bullocks consumed it hesitantly at first, but within a few days the animals grew accustomed to it and DM consumption increased, indicating that the hay was palatable (Gupta et al., 1981). Rice bean straw was reported to be relished by cattle (Göhl, 1982). In India, 22 month-old calves fed a mixture of fresh Sudan grass (Sorghum × drummondii) and rice bean forage (54:46 fresh basis) for 64 days had a DM intake of 1.90 kg DM/100 kg LW and a daily weight gain of 456 g/d (Singh et al., 2000). In India, 22 month-old calves fed a mixture of fresh Sudan grass (Sorghum × drummondii) and rice bean forage (54:46 fresh basis) for 64 days had a DM intake of 1.90 kg DM/100 kg LW and a daily weight gain of 456 g/d (Singh et al., 2000). Rice bean hay is generally used as a protein source to supplement poor quality roughage-based diets in ruminants. In Thailand, rice bean hay supplementing a Congo grass (Brachiaria ruziziensis)-based dairy cow diet increased milk yield and decreased feed cost, resulting in higher farmer income. Rice bean hay supplementation did not alter rumen volatile fatty acid (VFA) production, or increase diet digestibility and intake (Wanapat et al., 2012). In India, a trial with bulls showed that rice bean hay had a moderate OM digestibility (50%) but that it contained nitrogen, calcium and phosphorus in adequate amounts to meet the maintenance needs of adult cattle (Gupta et al., 1981). In Vietnam, a mixture of cassava hay and rice bean hay (3:1 ratio) replaced 60% of concentrate in a forage-based diet (Pennisetum purpureum + urea-treated rice straw) offered to growing crossbred heifers, resulting in higher daily weight gain (609 g/d), better feed efficiency and reduced feed costs (Thang et al., 2008). In Thailand, rice bean hay included at 600 g/d to supplement rice straw in diets for swamp buffalo increased DM intake, digestible protein and N retention. It had a positive effect on rumen microflora, resulting in increased VFA production and lower CH4 emissions (Chanthakhoun et al., 2011). Adding rice bean hay was reported to increase cellulolytic rumen bacteria, thus improving the utilization of high fibrous feeds in buffalo diets (Chanthakhoun et al., 2010). In India, supplementing local goats fed grass with rice bean hay (15% of diet DM) did not increase grass intake, but total DM intake and nutrient digestibility were increased. Increasing the level of rice bean level above 15% had no further effect on digestibility (Das, 2002). In India, a trial with bullocks showed that rice bean straw had a low OM digestibility (31-47%) and it was recommended to supplement a rice straw-based diet with energy-rich feed materials, such as cereal grains or bran (Chaudhuri et al., 1981). In India, rice bean seeds are fed to buffalo calves and sheep to provide energy. Rice beans replaced half the cereals and half the deoiled cake present in the concentrate offered to buffalo calves (Ahuja et al., 2001). In sheep, replacing 50% of the metabolizable energy from oat hay by rice bean seeds had no deleterious effect on sheep N balance, which remained positive (Krishna et al., 1989). Rice beans are rich in protein but contain trypsin inhibitors and other antinutritional factors that limit their use in poultry feeding. Raw rice beans fed to broilers at 20 or 40% of the diet exhibited adverse effects on growth. Roasted rice beans gave better results and were included at 40% without hampering performance, but weight gain was lower than with the control diet (Gupta et al., 1992). Several experiments in India have compared rice bean forage favourably with other locally available fodders. A comparison of rice bean forage, pea forage and stylo (Stylosanthes hamata) fed ad libitum to adult rabbits concluded that rice bean forage could be fed at up to 25% (DM basis) of the diet (Gupta et al., 1993). A comparison of rice bean forage with leaves of two Indian trees, amliso (Thysanolaena latifolia) and nevaro (Ficus spp. ), included at 30% (DM) in the diet of growing rabbits resulted in higher growth from the rice bean (Bharat Bushan et al., 1997). In a comparison of rice bean forage, Congo grass (Brachiaria ruziziensis) and groundnut leaves fed at 300 g/d to growing rabbits for 6 weeks, all production and feeding measurements were best in the group fed rice bean forage (Das et al., 2004). Rajerison, R., 2006. Vigna umbellata (Thunb.) Ohwi & H.Ohashi. In: Brink, M. ; Belay, G. (Eds.). PROTA 1: Cereals and pulses/Céréales et légumes secs. [CD-Rom]. PROTA, Wageningen, Pays Bas.